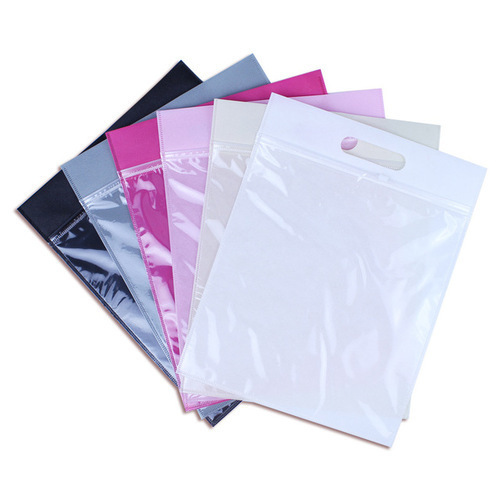 Haivng years of experience in the industry, we offer world-class array of Non Woven Zipper Bag. that are manufactured with perfection. Our entire product range is extremely spacious in nature and ensures high strength. Zipper Bag is Eco-friendly in nature and is tear-resistant. Zipper Bag are quality tested and are offered in varied standards. Established in 2011 at Surat (Gujarat, India), we "Welcome Packaging" Unit of Finix Enterprises Pvt.Ltd (ISO 9001:2015 Certified Co.),are known as the most prominent Manufacturer and Exporter of a comprehensive assortment of Bags. The offered range includes D cut Zipper Bags, Plastic Roll, Blanket Bag, Shopping Bag, Cosmetics PVC Bag, Saree Set Cover Bag and Non Woven Shopping Bag. The provided bags are highly acclaimed by our esteemed clients for secure packaging and carrying of apparels and other allied items. The bags, offered by us are designed using quality tested raw material and advanced technology in accordance with the set industry standards. High on demand in the market, the offered bags are widely known for their high strength, perfect finish, captivating prints, easy to carry design, recyclable and tear resistance nature. In addition to this, we also provide these fashionable shopping bags with various customized prints that make them suitable for advertisement, shopping and sales promotions. Besides, we provide these bags to our clients at the most competitive price range. Supported by an ultra-modern infrastructure, we have been able to work to attain maximum customer approval and satisfaction. To ensure that all the on-going processes are carried out in the most streamlined manner, we have carefully divided our infrastructure into several units such as manufacturing, quality testing, research & development and warehousing & packaging unit. The standardized operation is assured with the help of regular up gradation of our infrastructure with latest machinery and equipment. Moreover, we have appointed a team of skilled professionals to handle and manage different units of our infrastructure in the most efficient manner. Under the supervision of our Director, Mr. Kamlesh Thummar, we have been able to cater to the precise needs of our valuable customers in the most efficient manner. His experience and knowledge have helped us in attaining a commendable position in this domain.